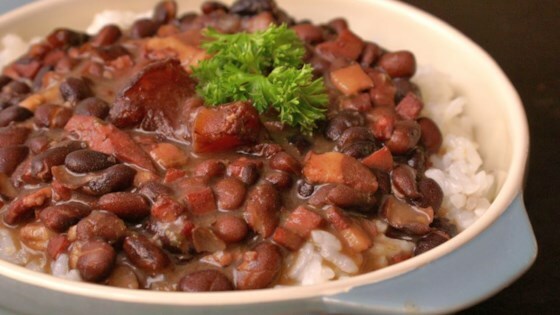 "This is my version of a traditional Brazilian black bean stew that maintains the rich smoky, flavors famous in Brazil. Additional meats, including sausage, may be added if desired. This is excellent served over brown rice." Heat the oil in a large pot or Dutch oven. Add 3/4 cup of chopped onion, green onions, and garlic; cook and stir until softened, about 4 minutes. Pour in the soaked beans and fill with enough water to cover beans by 3 inches. Bring to a boil, then reduce heat to medium-low, and simmer uncovered for 2 hours, or until tender. While beans are cooking, place ham hocks in smaller pot with 1/4 cup of the chopped onion. Cover with water and simmer, until meat pulls off of the bone easily, about 1 hour. Drain and add to the beans. Drain the bacon and ham mixture, and add to the beans. Season with bay leaves, coriander, salt and pepper. Simmer uncovered 30 minutes more. Stir in chopped cilantro and parsley just before serving. Substitute a pork roast and a full kielbasa for the meats and you'll be approximately right. The rice must be white, cooked pilaf style, and sprinkle farofa (wiki it) across the top. Having lived in Brasil I really wanted to find a good Feijoada recipe that didn't take forever to make. This one tastes great and doesn't take all day.